After the End: Who Put the Bad in Bad Kreuznach? There was no “peace treaty” in place at the end of the War. German POWs were labelled “disarmed enemy forces” (DEF) rather than “prisoners of war” in order to skirt provisions of the Hague Land Warfare Convention which mandated humane treatment, including that which stated: “After the peace treaty, prisoners of war should be dismissed into their homeland within shortest period.” By this manipulation of justice, German POWS could be taken to the lands of their former enemies and used as slave labor for extended periods, often at the cost of their lives due to grim hardships encountered before, during and after transit. Furthermore, a German soldier designated as DEF had no right to any food, water or shelter, and could, as many thousands did, die within days. There were no impartial observers to witness the treatment of POWs held by the U.S. Army. From the date Germany unconditionally surrendered, May 8, 1945, Switzerland was dismissed as the official Protecting Power for German prisoners and the International Red Cross was informed that with no Protecting Power to report to, there was no need for them to send delegates to the camps. Half of the German POWs in the West were imprisoned by the US forces, half by the British. The number of prisoners reached such a huge proportion that the British could not accept any more, and the US consequently established the Rheinwiesenlager from April to September of 1945 where they quickly built a series of “cages” in open meadows and enclosed them with razor wire. One such notorious field was located at Bad Kreuznach where the German prisoners were herded into the open spaces with no toilets, tents or shelters. They had to burrow sleeping spaces into the ground with their bare hands and in some, there was barely enough room to lay down. 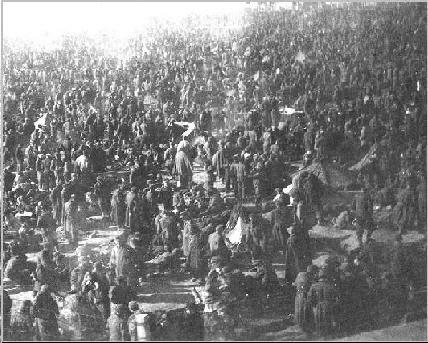 In the Bad Kreuznach cage, up to 560,000 men were interned in a congested area and denied adequate food, water, shelter or sanitary facilities and they died like flies of disease, exposure and illness after surviving on less than 700 calories a day. There are 1,000 official graves in Bad Kreuznach, but it is claimed there are mass graves which have remained off limits to investigation. Only by the autumn of 1945, after most camps had closed or were in the process of closing, was the Red Cross granted permission to send delegations to visit camps in the French and UK occupation zones and to finally provide minuscule amounts of relief, and it was not until February 4, 1946, that the Red Cross was allowed to send even token relief to others in the U.S. occupation zone. The death rate for prisoners in these U.S. camps was at that point 30% per year, according to a U.S. medical survey, but nearly all the surviving records of the Rhineland death camps were destroyed. There were also numerous accidents in transport. A few weeks after the war officially ended, on July 16, 1945, a US military freight train carrying tanks near Munich was signalled to proceed by an American signalman despite the track ahead being blocked by a train carrying German POWs which had stopped due to an engine breakdown. It slammed into it and killed 96 German soldiers. At the end of June, 1945 the first camps in Remagen, Böhl-Ingelheim and Büderich were dissolved. SHAEF offered the camps to the French, who wanted 1.75 million prisoners of war for use as slave labor. 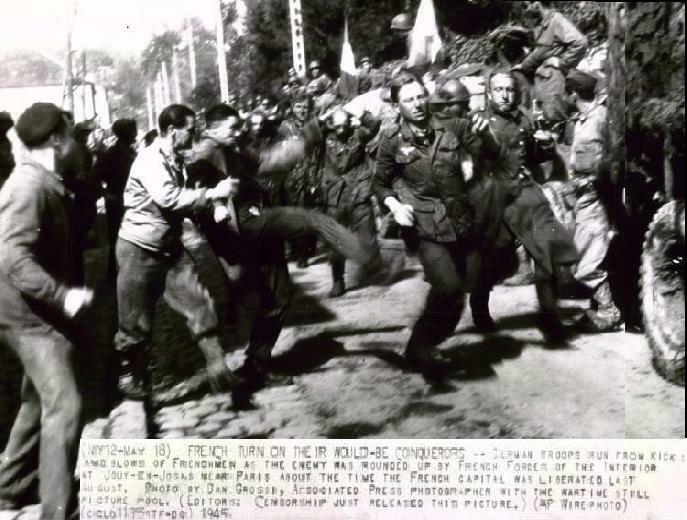 In July, Sinzig, Andernach, Siershahn, Bretzenheim, Dietersheim, Koblenz, Hechtzheim and Dietz, all containing thousands of prisoners, were given to France. In the British Zone, prisoners of war who were able to work were transferred to France and the rest were released. 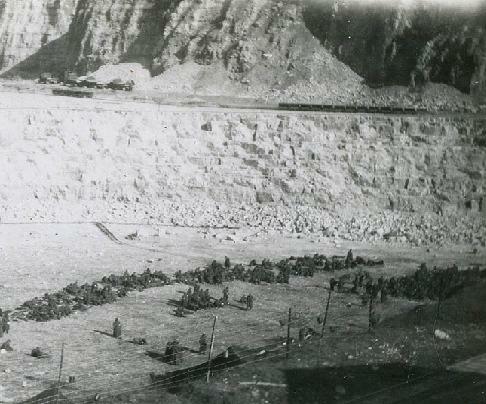 At the end of September, 1945 all the initial camps were dissolved. At one point, 80,000 prisoners of war a month were supposed to have to been returned from USA captivity and discharged into the Allied zones of Germany as part of the 1.3 million allotted to France for “rehabilitation work” (slave labor), but after the Red Cross reported that 200,000 of the prisoners already in French hands were so undernourished they were unfit for labor and likely to die over the winter, the USA stopped all transfers of prisoners to French custody until the French would maintain them in accordance with the Geneva Convention. By winter 1947, it was estimated by the International Red Cross that 4,160,000 German POWs were still held in ‘work camps’ outside Germany: 750,000 in France, 30,000 in Italy, 460,000 in Britain, 48,000 in Belgium, 4,000 in Luxembourg and 1,300 in Holland (as discussed later, the Soviet Union started with between four and five million, Yugoslavia had 80,000 and Czechoslovakia 45,000) as well as the USA’s 140,000 in the US Occupation Zone with 100,000 more later also held in France. It is estimated that 700,000 to a million men may have died within the period they spent incarcerated in American and French camps alone from 1945 to 1948. There are much higher estimates, however, and attempts to uncover the truth regarding these camps in modern times, as well as excavation of reported mass grave sites, have been vigilantly thwarted by, among others, the German government. It is unknown how many perished under British captors but recently declassified documents indicate widespread torture and abuse. Under all of them, many of the prisoners were used to do dangerous work such as working with hazardous materials and mine sweeping in complete disregard of the law. In total, 5,025 German men and women were convicted of war crimes between 1945 and 1949 in the American, British and French zones by Allied War Crimes Trials. Over 500 were sentenced to death and the majority were executed, among them 21 women. Many German soldiers at the end of the fighting desperately tried to get to a place where they could be taken captive by the Americans rather than the Russians. Some swan, ran or crawled to safety. Others resorted to stealing US jeeps or donning US uniforms to accomplish this and when caught were usually treated as spies and executed. If captured in small groups, the US Army unofficial policy was to slaughter the prisoners where they stood if they were SS. The largest (currently acknowledged) massacres at the hands of the Americans were the murder of 700 troops of the surrendered 8th SS Mountain Division, atrocities carried out against the surrendered SS Westphalia Brigade where most of the German captives were shot through the back of the head, and the machine gunning of 300 surrendered camp guards at Dachau. There was also an alleged mass murder of as many as 48 surrendered German prisoners who were captured on April 15, 1945 at Jungholzhausen. An eye-witness stated: “The Americans forced the Germans to walk in front of them with raised hands in groups of four. Then they shot the prisoners in their heads from behind.” The bodies were loaded onto a truck and taken away. The matter is still “under investigation”! There were other incidents of lawlessness and outright murder. A mass grave outside of Nürnberg discovered after the war contained the bodies of some 200 SS soldiers. Autopsies revealed that most had been shot at close range or beaten to death by US Seventh Army rifle butts. In the village of Eberstetten, 17 German soldiers of the ‘Gotz von Berlichingen’ Division were shot after they surrendered to US troops. 14 members of the 116th Panzer Division were marched through the streets of Budberg on April 8, 1945 to the US 95th Infantry Division command post where they were lined up and shot. Three were wounded and managed to escape. On April 13, 1945, the US Infantry entered the village of Spitze near Cologne and made the village inhabitants gather in front of the church. 20 German soldiers among them, members of an anti-aircraft unit stationed in the village, were separated and marched several hundred yards to a field just outside the village where they were lined up and mowed down by machine-gun fire. The US Army ordered the civilians to dig graves and bury the dead. A memorial for the victims was built in 1995. Author Martin Sorge writes: “It was in the wake of the Malmedy incident at Chegnogne that on New Year’s Day 1945 some 60 German POWs were shot in cold blood by their American guards. The guilty went unpunished. It was felt that the basis for their action was orders that no prisoners were to be taken.” An official history published by the United States government denies this. In another case, poisoned bread was fed to German prisoners in one camp. 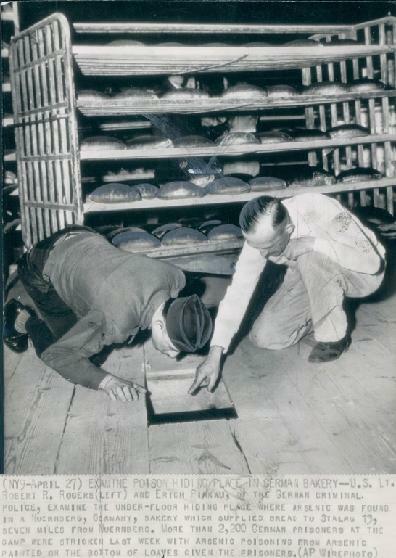 There are differing accounts of the story, but the official American version was that a bakery worker who supplied bread to American prison camps claimed he received arsenic in bottles from Paris and poisoned 3,000 loaves of bread. 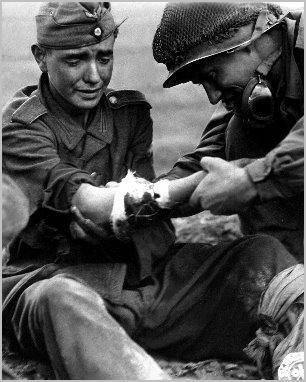 It sickened over two thousand men and the death toll was anywhere from 200 to 700 German veterans. This criminal act was never prosecuted. 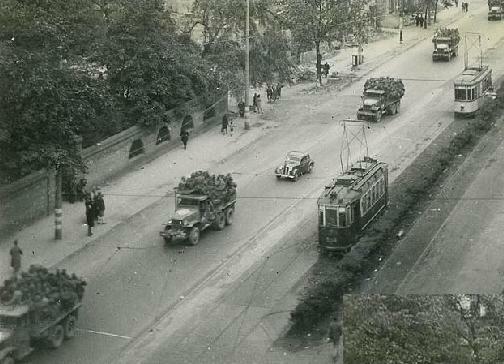 In 1945, thousands of German POWs were jammed into US Army vehicles going through towns such as Nürnberg and Emskirchen (below). They often traveled for hundreds of miles without being able to sit and with no food, rest or relief stops. 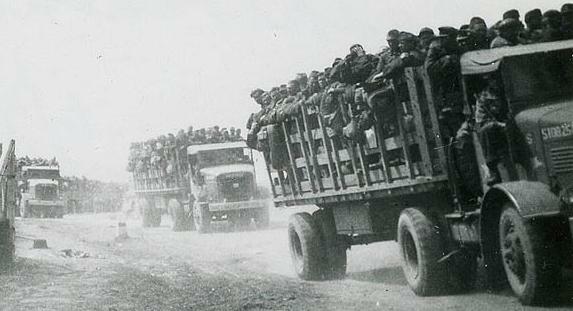 Hundreds of German prisoners were confined in makeshift US camps. Some were sent to fields, mudholes, quarries and other hell-holes. The photos below show the magnitude of the situation. 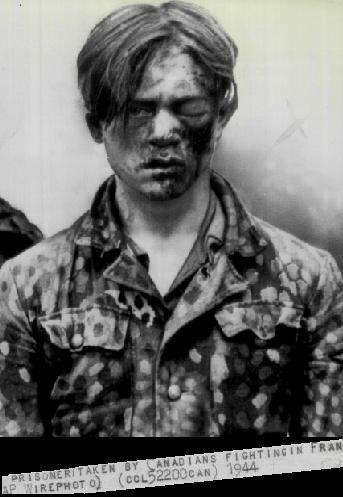 Many of the German POWs were mere boys when they were captured and were therefore better able to survive the brutal conditions of slave labor under the communists. When they finally came “home,” many had no living family, no homeland and no thanks for their sacrifice since it is politically incorrect to honor Germany’s soldiers. In 1955, in West Germany at Friedland camp, the last (official) surviving German prisoners of war were finally released from the Soviet Union after 10 long, hard years of slavery, and they arrived singing a hymn which is sung in countless churches worldwide and in many languages. The old German hymn of thanksgiving called ‘Nun danket alle Gott’ written long ago by a Lutheran minister in Eilenburg, Saxony named Martin Rinkart, the son of a poor coppersmith. The hymn was originally titled “Tisch-Gebetlein,” or a “little prayer before the meal” and this humble prayer has an astonishing history and has been sung on many powerful occasions. During the Thirty Years’ War, the walled city of Eilenburg witnessed sorrowful crowds of refugees pouring through its gates seeking refuge from the carnage. The Swedish army surrounded the city and famine and plague ensued, taking a terrible toll. In the first year, thousands perished. All but three town councilmen died along with scores of school children. Burying upwards of fifty people a day, the town pastors succumbed one by one until Rinkart was the only one left. The town was unable to pay the huge ransom the Swedes demanded as protection money, and the famine which followed the pestilence was so dire that people fought in the streets over a dead animal or bird. Rinkart, still grieving over the death of his wife and with no regard for his personal safety, left the security of the walls to beg for mercy. The Swedish commander was so impressed by his courage that he altered his demands. Even though Rinckart’s own losses were so great that he could barely feed his children and had to mortgage his future income for several years, he wrote this hymn for a thanksgiving service as the war was ending. Towards the end of the 17th Century, the song had been inserted in many Protestant church song books in Germany. The song took countless musical adaptations, including those of Pachelbel, Telemann, Bach, Liszt, Reger and others. This hymn was also sung by the Dissenters in Leiden before embarking on the Mayflower to Massachusetts. It was famous in the 18th century as ‘The Hymn of Leuthen,’ in reference to the Seven Years’ War, when on December 5, 1757, the Prussian army under Friedrich the Great defeated the Austrians in the Battle of Leuthen. The losses at Leuthen were high on all sides: 3,000 killed and 7,000 wounded on the Austrian side, and more than 1,000 deaths with more than 6,000 wounded on Prussian side. Following the heated battle, a lone Prussian soldier began to sing ‘Nun danket alle Gott’ and suddenly the entire Prussian army of up to 25,000 men spontaneously took up the hymn of thanks. Later, it was the “theme song” of the Mennonites fleeing persecution in Russia in the 1920s. Nun danket alle Gott mit Herzen, Mund und Händen. Unzählig viel zu gut und noch jetzund getan. Und uns aus aller Not erlösen hier und dort. Und ist und bleiben wird jetzund und immerdar. An interesting footnote: After the war, many German combat veterans joined the French Foreign Legion, some recruited directly from POW camps. Others were men who had no home to return to. Highly regarded by the French for their discipline and bravery, up to 70% of the French Foreign legion after 1945 consisted of former German soldiers. The Germans maintained their own sergeants and spoke German almost exclusively. From 1945-1954 the Legion Etrangere recruited 30,000-35,000 Germans. During the 1st Indochina War c. 40-50% of the LE personnel in South-Eastern Asia were Germans and among the last 7,000 soldiers that left Vietnam in 1954 after the peace treaty, 1,600 were German.